WWE officially begins the build to WrestleMania tonight with the 2017 Royal Rumble taking place at the Alamodome in San Antonio, Texas. 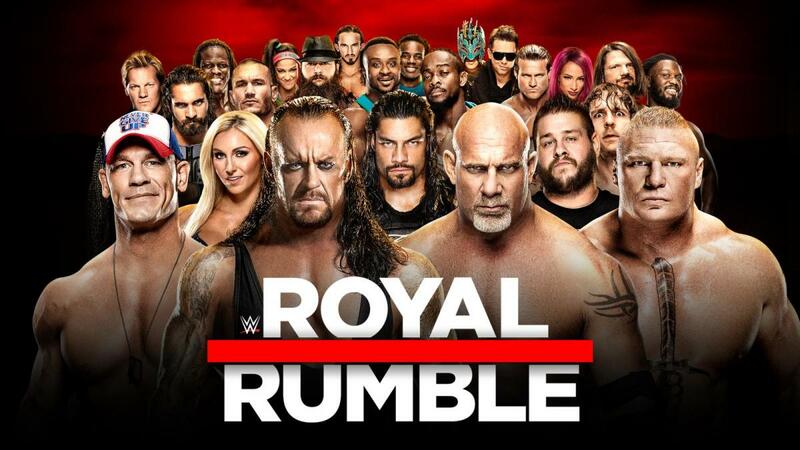 This year's Rumble match features one of the most star-studded fields in recent memory, including Goldberg, Brock Lesnar, and The Undertaker. In addition to the Rumble, both Raw and SmackDown's top titles will be on the line. AJ Styles will defend his WWE Championship against John Cena, while Roman Reigns will challenge Kevin Owens for the Universal Championship. Owens vs. Reigns will be a no disqualification match, with Chris Jericho also suspended above the ring in a shark cage. Raw's other titles will be up for grabs as well. Charlotte Flair will defend her Women's Championship against Bayley, Neville will face off with Rich Swann for the Cruiserweight Championship, and Luke Gallows & Karl Anderson will challenge Cesaro & Sheamus for their tag titles on the pre-show. Our coverage of all of that and more begins with the pre-show before the main card kicks off at 7 p.m. ET. Good match that served a clean purpose. Nikki took out Natalya and Lynch took out James after Naomi made the hot tag and Naomi pinned Bliss after a split legged moounsault, so Naomi will be the new challenger for Bliss' title for now. Most of the match was heat on Lynch. Gallows & Anderson won the titles. Sheamus took out one ref (John Cone) with the Brogue kick. Cesaro had the sharpshooter on Anderson but Gallows broke it up. Anderson & Gallows used the Magic killer on Sheamus.. Cesaro clotheslined Gallows over the top rope and then Anderson used a schoolboy on Cesaro and used the trunks for the pin. This was a good match as well and the crowd got into it pretty well. This was pretty much booked like a squash match. Jax powered out of the bank statement like it was nothing. Jax took out Bank's left knee and also kicked out of double knees. Jax then got the pin after a Samoan drop. This was not good at all. I mean, nothing terrible about it, just it was short and was flat. They announced 52,020 as the attendance. We don't have a real number yet. The match was good but ended suddenly. Charlotte used Natural Selection on the apron and got the clean pin. There were a few near falls. Charlotte got her mouth busted up from a jumping downward spiral by Bayley. Bayley did a plancha and also did an elbow off the top for a near fall. Charlotte worked over the left leg to set up a figure four spot as well. The crowd was pretty hot for the match. That was an amazing. Owens retained the title when Reigns had the match won after giving him a power bomb through the American announcers table. He was ready to win when Braun Strowman threw Reigns into the post, choke slammed him on the German table, which didn't break and then powerslammed Reigns into a table set up in the corner of the ring and Owens rolled over and pinned him. This was a very physical match. Reigns was cut from the bridge of he nose and Owens was cut over the left eye. At one point Reigns gave Owens a Superman punch knocking him off the ropes and he fell backwards onto seven chairs set up earlier in the match. Owens also did a frog splash off the top rope flying onto Reigns through a table on the floor. Jericho dropped Knux from the shark cage and Owens used them with a Superman punch for a near fall. So Reigns vs. Strowman looks likely for Fast Lane. And Reigns may screw Strowman later in the Rumble tonight. Neville won the title clean with a superplex off the top rope and the crossface submission. They had a hard time following he previous match even though they gave them a long break between matches. Very good match. Strong athleticism and timing. They did one big spot which was Swann doing a Phoenix splash off the middle rope outside the ring. This wasn't as good as a lot of the bouts in the cruiserweight tournament, they still haven't hit that level since the tourney. We have two hours and 20 minutes left for two matches. Super match. They went 24:00 and this was clearly their attempt to do the match of the year. The finish saw Styles hit a second Styles clash but was selling so didn't get the pin. He went for a springboard move but Cena got him on his shoulders and used an Attitude Adjustment and then rolled over and hit second one for the clean pin to tie the supposed Ric Flair record. The match was basically them doing every move in the world and kicking out. Styles kicked out of the first AA early and a second one off the middle rope. Styles used the forearm, the Styles clash, with Cena kicking out. Cena also did a Big ending, Styles used the calf crusher, Cena used the figure four. Cena of course did the STF as did Styles. With this match and the Owens-Reigns match it's been a long time since WWE has had a show with two matches of this quality. They announced that on Raw, Stephanie would confront Seth Rollins. I sure hope that doesn't mean no Rollins angle on the show. We have time for the longest Rumble in history. Enzo is doing a super long promo before the Rumble since Cass is the first guy out. They put over that everything is bigger in Texas. Enzo is mentioning all the big guys in the Rumble, names he mentioned were Strowman, Undertaker, Lesnar, Goldberg, Show and Wyatt Family. Chris Jericho is No. 2. Randy Orton won the Royal Rumble with an RKO and throwing out Roman Reigns. This was one of the better Rumbles ever with lots of storylines, built around the key people. Final four were Orton, Reigns (No. 30 in), Wyatt and Jericho. Reigns used a Superman punch to knock Jericho out. Reigns threw Wyatt over the top leaving Reigns and Orton. The last three eliminations took about a minute. 1) No surprises at all as far as names from the past or debuting guys except for Tye Dillinger, who did come in at No. 10. It felt like it was just to placate fans as opposed to him debuting but no way to know. The crowd was more upset when he was eliminated than almost anyone. Fans were chanting for him once No. 9 came out,. 3) Cesaro was giving everyone giant swings for a while. 4) Jericho started No. 2, went just over one hour, but was knocked out by Big Show and sold on the floor for a long time. He also hit on the floor. 5) Rusev was wearing a noseguard so he must have broken his nose on Monday. 7) Luke Harper may have turned face as he attacked Wyatt & Orton. 9) Goldberg and Undertaker came face to face before people attacked them. Goldberg speared Undertaker but Undertaker came back to eliminate him. 10) Reigns was No. 30 in as a surprise and interacted with Undertaker including eliminating Taker. The crowd hated Reigns all night. Crowd chanted "bullsh*t" when Reigns eliminated Undertaker. 11) No Rollins or HHH at all.